Having now made up my additions to my "Simple Horizontal Rig"
I thought an appropriate subject to try would be the Californian butterfly ZERENE eurydice , I relaxed and set a papered male specimen . Data;Alpine Dam, Marin County,California. May 28 1965. 30 frames with Zerene Stacker. Len, thanks for the eponymous tribute. I edited your first post to correct the "XERENE" typo in place. That saves possible confusion for a reader, who otherwise might miss your correction farther down. I have to ask - is the "Zerene" name of the butterfly related to the use of the word "Zerene" in "Zerene Stacker" software?! Please forgive my errors and ignorance if I've missed something here and shouldn't have asked this question! DQE asked"What was Zerene Stacker named after?" I know that Rik will also enjoy my post. is the "Zerene" name of the butterfly related to the use of the word "Zerene" in "Zerene Stacker" software?! It is, but the connection is not quite as direct as you might think. When I went looking for a name for my software, I wanted something that was distinctive, personally meaningful, and not too hard to remember and/or pronounce. After much consideration, "Zerene" was the result. 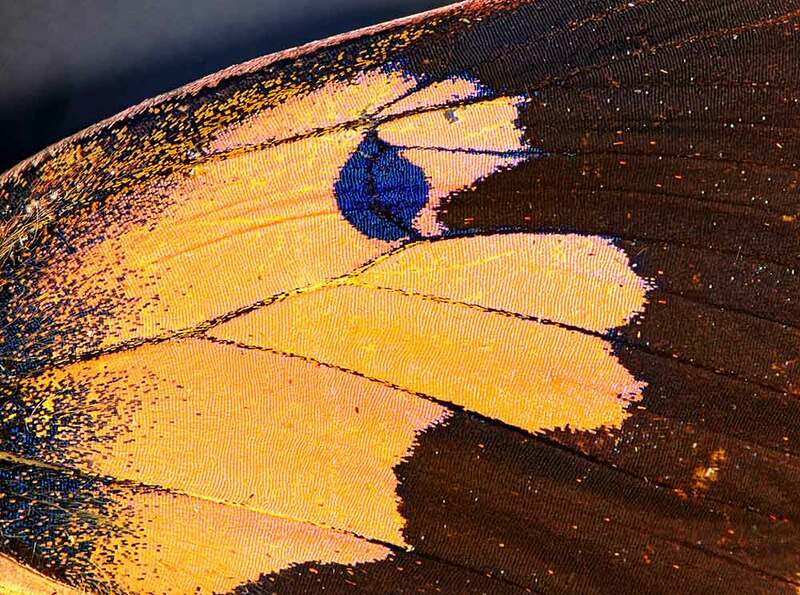 The “smiling dog” image used for the Zerene Stacker icon is in fact the wing pattern of a California Dogface butterfly, Zerene eurydice. However, it was a different butterfly, Speyeria zerene, that actually provided the name. The Speyeria's in general have been a big part of my life since elementary school, with S. zerene more than most. So it was a natural in that respect. Besides, I've read that the name "Zerene" derives from the Latin word "zerena", meaning parched or dry. That's a good description of the area where I live. I've been told it fits my sense of humor as well. As a final point, it turns out the name is easily read as rhyming with the English word "serene", which of course is how I want people to feel about using my software versus certain other packages that have to be struggled with. It's true that I've had to become bilingual about the pronunciation, since Latin-trained biologists pronounce the trailing "e" while in standard English it is silent. In the beginning, I spoke the name like the butterflies; now I go with the flow and rhyme it with "serene" as a word. This is more than you ever wanted to know, I suppose, but hey, you asked! Len, you're right -- I have enjoyed your post. It's worth mentioning that there is quite a bit of variation in the details of the wing pattern. Most specimens don't look so good when reduced to the size of an icon. The one used in the Zerene Stacker icon happened to retain the "smiling dog" motif even when reduced, so that's what I went with. On a different note; 30 images sounds like too many slices for this stack. Did the subject have a degree of 'wing' lift which required compensation via additional frames? When you 'set' moths and butterflies, do you prefer the 'flat' setting boards or the slightly angled (up-lift) approach? What optics did you use for this image? Craig,Zerene was set on a flat balsa setting board ,the convention is to always set on flat boards ,and a added bonus is that “flat set Lepidoptera” can be overlapped (like scales) in cabinet drawers or store boxes, giving a higher specimen to space ratio. Optics used was Nikon VR 105, on D200, at closest focus 1-1,getting the two Nikon SB-R200 of the camera and on to the concrete filled black painted plastic cups helped considerably in the placing of the flashes off camera. This set up is linked in the initial post. Cyclops, my specimen of Zerene was collected by my old friend Tom (TW) Davies. Tom’s collection is now in the California Academy of Sciences.